There is a small group of little-known craftsmen in Franklin, Tenn.—but that’s about to change. 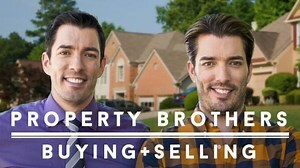 This Wednesday, Nov. 14, HGTV’s hit series, “Property Brothers: Buying + Selling, ”will showcase the products of TN Box Beams. But, unlike the major brands typically featured on the show—the handcrafters behind these beams are local, 20-somethings—entrepreneurs and artisans–and this is their first foray into a national spotlight. 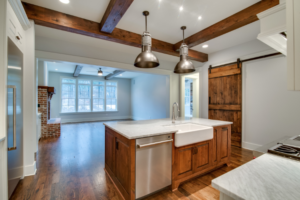 But while they transform raw wood into high-quality products that add warmth and beauty to homes, TN Box Beams craftsmen really are about transforming lives. 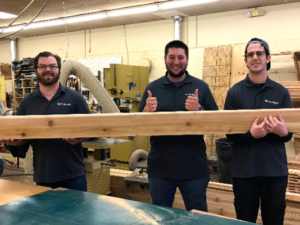 The young craftsmen behind TN Box Beams are, left to right, Sales Representative Kenny Bowling, Wood Shop Manager Colin Hemberg and Wood Shop Team Member Heath Hill. “TN Box Beams transforms raw wood into beautiful wood beams in our Franklin shop–but most importantly, our work transforms lives,” said Stoner. That story begins about 28 miles down the road at Narrow Gate Lodge, an 8-month, tuition-free, residential program on 122-acres in Williamsport, Tenn. It’s purpose? Helping young men discover a life that matters. About to enter its 15th year, almost 400 young men have come through the Narrow Gate Experience, finding new purpose in life. Lodge participants live and work together while pursuing new life skills, challenging adventures, biblical training, and discipleship. They are exposed to wood-, leather- and metal-working and mentored by seasoned craftsmen. Some, like the builders of TN Box Beams, discover they are gifted at working with their hands and pursue vocations as craftsmen. Narrow Gate Trading Co. (originally known as Narrow Gate Artisans) evolved as a social enterprise to provide a sustainable source of income for the nonprofit and its craftsmen are makers and purveyors of fine wood and leather goods. To date, it has employed about 40 graduates of Narrow Gate Lodge. The box beam portion of the enterprise flourished, becoming an entity all its own—TN Box Beams. Customization options include design, dimension, stain, rough or smooth finish, and hand-applied textures.